Discover the complete photo album (with captions) of users of DXBeam antennas who have sent us a picture of their installation. 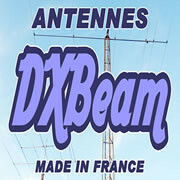 If your photo isn't yet in our album, even if it is of a DXBeam antenna bought secondhand, please be kind enough to send us one or two examples (minimum 800x600 - landscape) so that we can have the pleasure of publishing them on our site. There are currently 222 photos in this album.